The Best Champagne Served on Business Class Flights Written by Barnaby Taylor. Published on 11th February, 2019 . Champagne, Champagne; most of us love the bubbles! 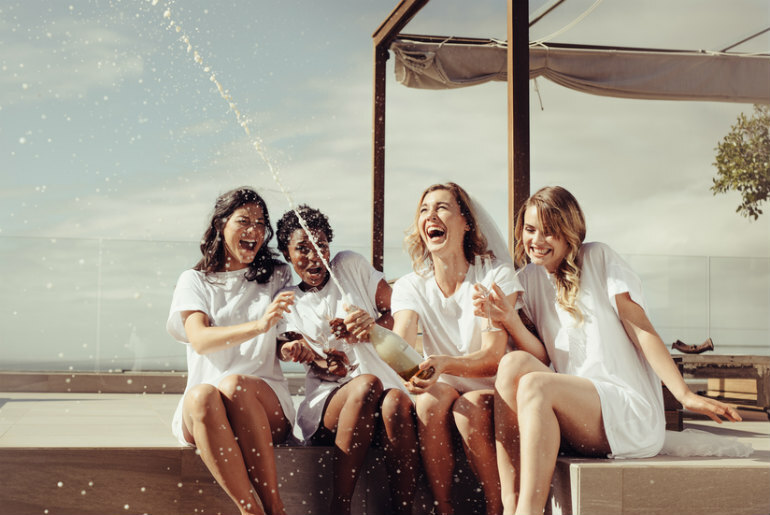 So whether you’re flying business class for a fabulous holiday, or simply because you want to be rested on a long haul flight, it comes with a whole host of perks! Sure, there is the great in-flight entertainment, the spacious legroom and the comfortable seat/bed for that crucial in-air shuteye, but a major part of what a business class traveller can look forward to is the food and beverage experience. This experience often starts from the business class lounge, where travellers are offered their first beverage and some small but delightful snacks to get their trip started. In fact, the more premium food and drink experience can be one of the biggest reasons why many people decide to upgrade to business class. Onboard Dining: What’s All the Fuss? Airlines are investing millions in their food and drink offerings in business and first class. Business class airline meals will make you forget airline food as you know it. To create even more of a point of differentiation between their premium and economy seats, airlines are investing a considerable amount into the food and drink on offer in business class. With the right champagne selection, the business class experience can become even more special for travellers. From the business class lounge to the air, you can expect a range of treats to keep you well fed and hydrated. Of course, this also includes champagne. Champagne has a knack of making any experience that much more exciting, and a business class flight is no exception. From the minute you are handed your first flute in the lounge, you’ll know it’s time to start enjoying the business class experience. To add to the experience of their carefully curated food menu, the top business class airlines have paired them with the best champagne. The best ones have taken pains to ensure that they’ve picked bubbly that tastes as good at 30,000 feet as it does on the ground, as our taste and smell can be affected in the cabin. 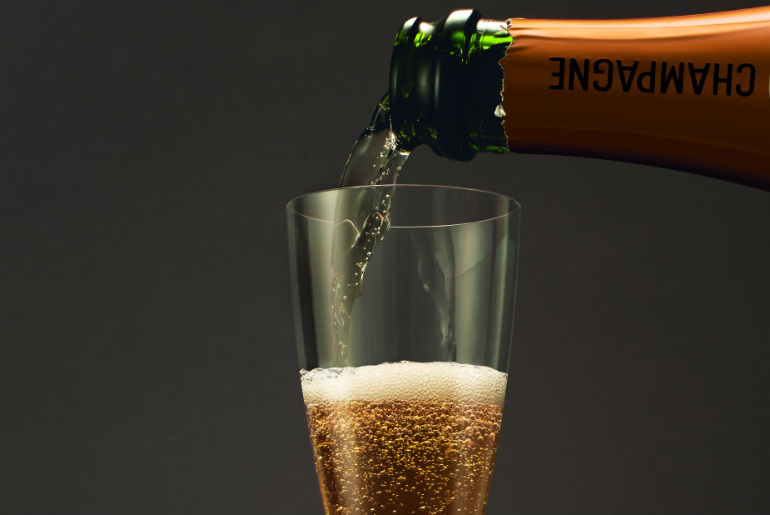 A strong Champagne with a bit of spice tends to be more suited to flight conditions. 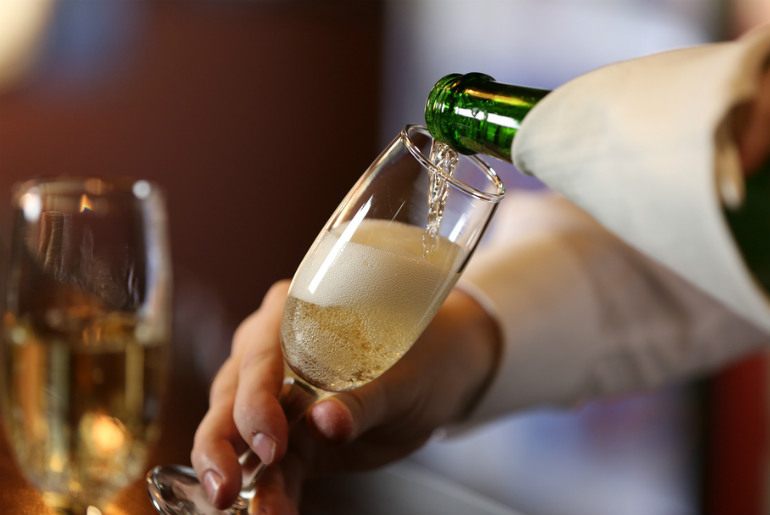 Now, if you’re a true champagne enthusiast, you may want to know exactly which one you’ll be served up before you get on board. 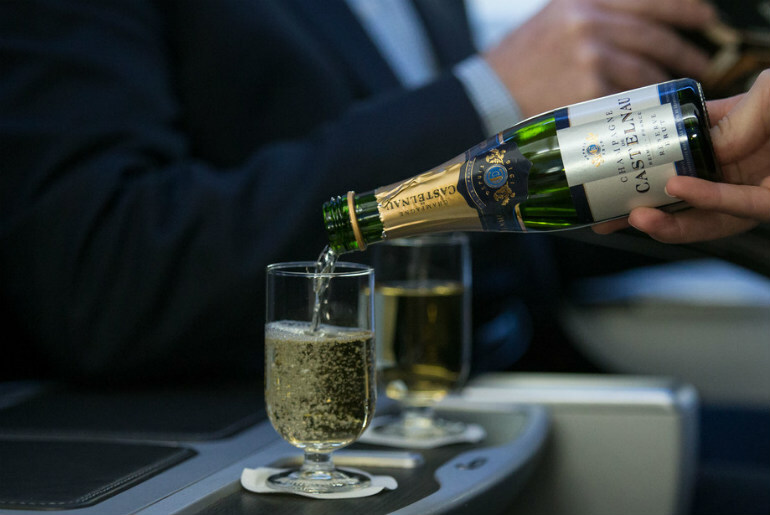 Here’s our list of the best champagnes currently served on business class flights. Japan Airlines have their very own team of wine advisors, which includes a Master of Wine – Kenichi Ohashi, and a Wine Taster – Motohiro Okoshi. This shows you just how serious they are about serving up the right alcoholic beverages together with their exquisite food options. In terms of champagne, Japan Airlines serve up the critically acclaimed Salon for flagship routes, including New York and London. Business class travellers can now choose between Canard-Duchêne Cuvee Léonie Brut Champagne and Champagne Besserat de Bellefon on air. They will also continue to serve Castelnau champagne. Trust us, you won’t want the flight to end! 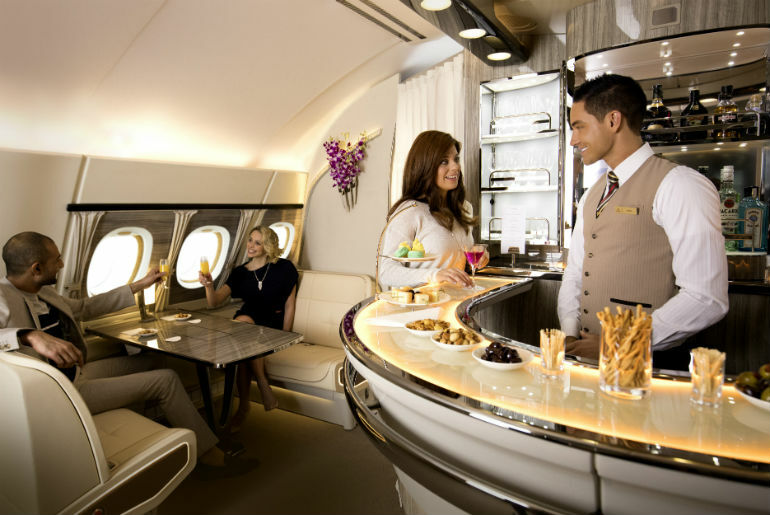 Emirates business class is renowned for being one of the most luxurious. And they don’t hold back when it comes to their food and drink selection. From the business class lounge to when you’re mid-air, you will be able to order a host of exquisite champagnes including the much loved Moët & Chandon. In fact, there is even an exclusive Moët & Chandon champagne lounge at the Dubai airport, where you can taste a range of flavours of the famous champagne brand. You can also enjoy Veuve Clicquot’s signature Yellow Label on board certain routes. 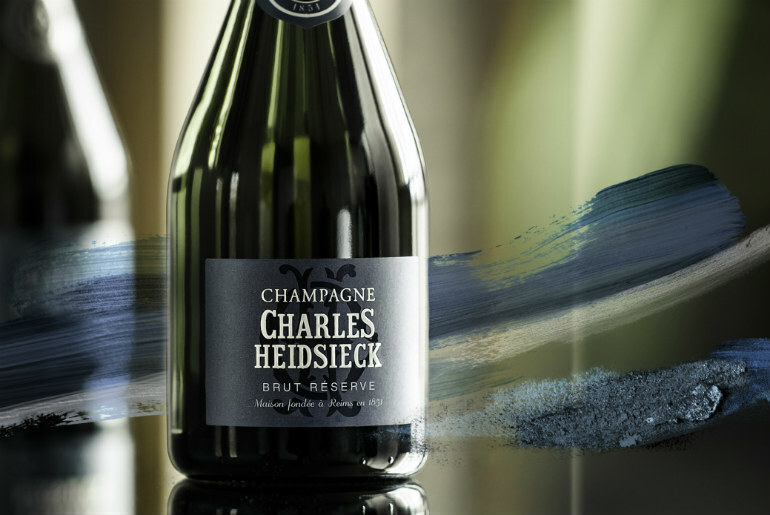 This classic Chardonnay Champagne is known as one of the benchmark non-vintage champagnes in the world. The business class experience at Singapore Airlines is by far one of the most premium you can experience. This is reflected in their choice of champagne. Not only can you get the trendy Dom Perignon 2004 on board, you can also sip the beautifully rich and perfectly aged Krug Grand Cuvee in the air. Qatar Airways offers a pretty impressive in-flight drinking experience on their A380, thanks to their upper deck bar. This is available to business class and first class passengers only, and you can get Krug Grand Cuvee, Drappier Rose, and Taittinger champagne. 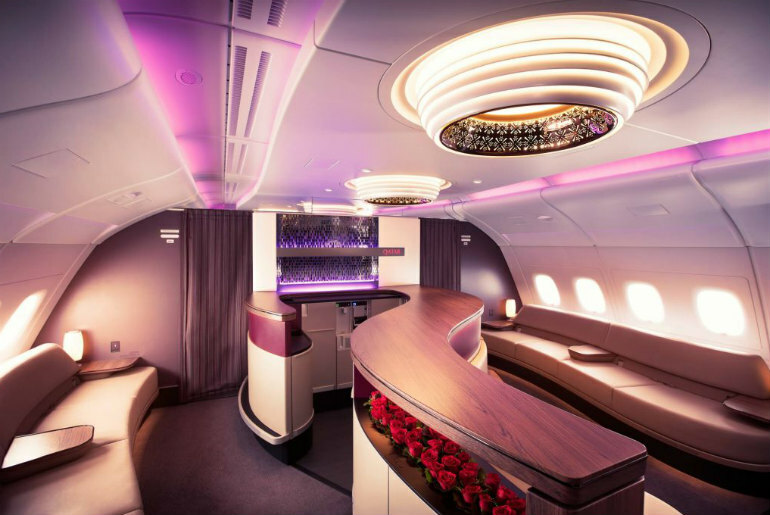 With the construction of their extremely spacious bar, Qatar have really taken the in-flight champagne experience to another level. Other than the incredible service on board Etihad Airways, you can also count on an exemplary food and beverage selection. 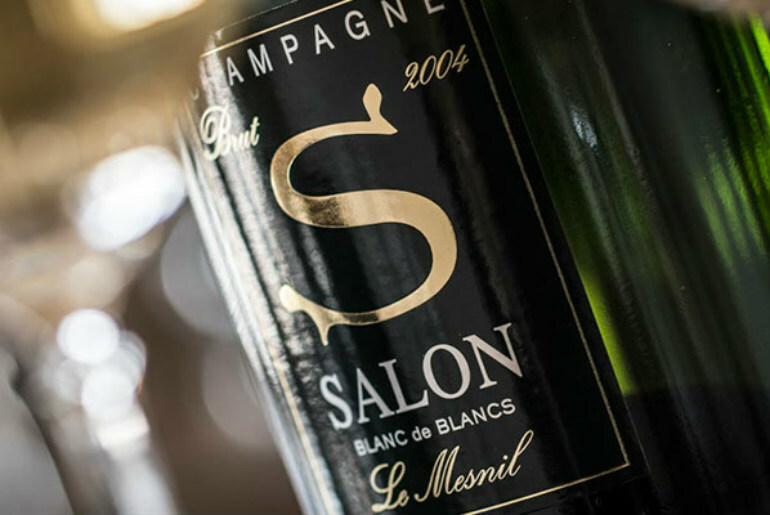 This includes a range of carefully selected wines and champagnes such as the Billecart-Salmon. 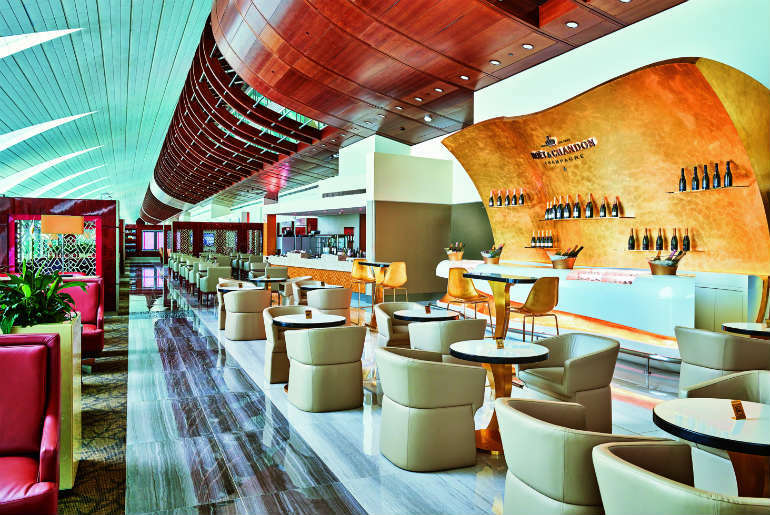 Though there isn’t a separate bar on the flight, you can head to the lounge onboard called ‘The Lobby’. Here, you’ll find plenty of space to relax and order drinks while enjoying a glass of chilled champagne. You may expect a lot from the champagne on a French airline flight, and Air France certainly doesn’t disappoint. 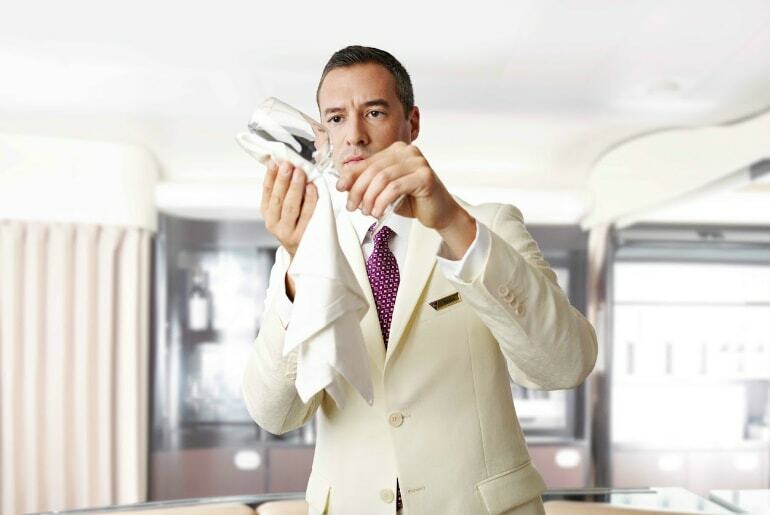 Business class passengers can enjoy the Champagne Deutz Brut Classic NV and other wines specially selected by Air France’s world-class sommelier, Paolo Basso. The beverages have been carefully chosen to further enhance their divine in-flight culinary experience. 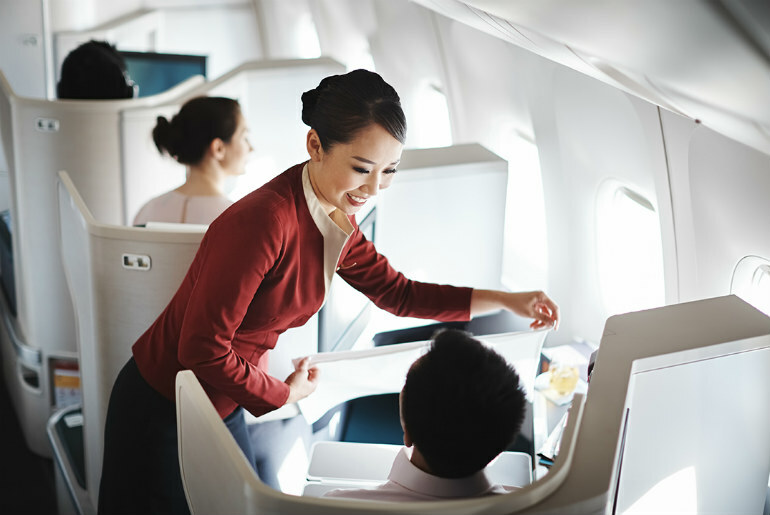 Not only does Qantas have some of the comfiest seats for business class, you can also enjoy bubbly treats such as Billecart- Salmon Brut and Charles Heidsieck Brut Reserve on board. Here at Just Fly Business, we’re dedicated on finding the best deals for business & first class flights for our clients. For an amazing business class champagne experience from before you even depart, contact us today on 020 8417 1366 or enquire online.